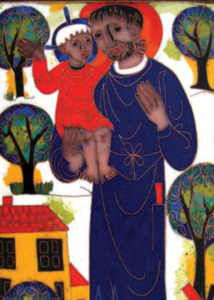 Home › Home News › St Joseph – Patient, humble and hidden. St Joseph – Patient, humble and hidden. Celebrate the life of St. Joseph this feast day with the following reflection and prayer put together by the Sisters of St. Joseph. “It is not exaggeration to think that it was from Joseph that Jesus learnt at – the human level –that steadfast interiority which is a presupposition of authentic justice. Sit with the image in silence. Allow yourself to be drawn into the image. What is God inviting you to notice as you gaze upon the image? Spend sometime with that aspect of the im-age. You may want to write a dia-logue with this aspect of the image and see what God wants to reveal to you at this time. What does this image tell you about God at the heart of Joseph’s life? What does it say to you about the God at the heart of your own journey of life? Simply sit in the silence and let the God of Joseph enfold you in love. Share with God the quality or virtue of Joseph’s life that you most desire. Allow God to respond to you in the silence. What is my response? Prayerfully read this thought of Mary MacKillop’s about St Joseph. Celebrating bold action on IWD! Take the Happiness Pledge on IHD!